By hungry runner on January 21st, 2010 . Filed under: Events, News, Other . In wake of the recent earthquake in Haiti there are tons of worthy charities to donate to. As mentioned with a post last week about Bleeding Heart Bakery, cupcakes are helping raise donations. In case you missed this past weekends event, another cupcake charity event is being held this Saturday, January 23, 2010 from 9am-1pm. 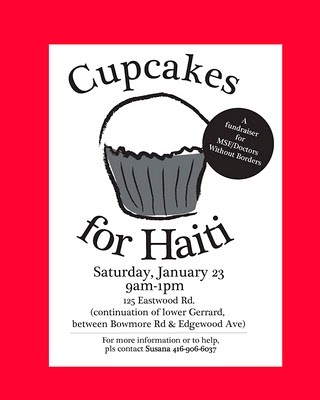 Cupcakes for Haiti in will be hosting a cupcake stand in Toronto, ON where sales from the bake sale will go to MSF/Doctors without Borders. Additional events that have already occurred but are still worth mentioning include the Bake Sale held in Ashburn, Virginai where the proceeds went to Food For the Poor. Additionally Foiled Cupcakes which delivers to Chicago and surrounding cities created a sweet deal: 2 dozen cupcakes were given to the first 5 people who donated $100 to the Haitian relief via the Red Cross. Hi there! Thanks for posting this. We had a great turnout and ended up getting many more interested people looking for ways to help those in Haiti through our cupcakes. Great work here, by the way!